First things first…Creating a really effective Website takes a great deal of careful preparation – and some effort on your part, too. Whatever the reason, view your Website through the eyes of a user. Identify what you do better than others. Demonstrate the benefits offered by your experience. Make your site better - easier and clearer - than the competition. 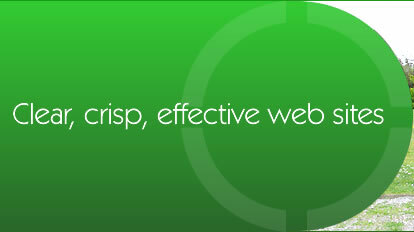 Your Website must have structure, based on the priorities of your key message. Draw your own site plan. Which information should be in your Main sections (accessible from every page on the site)? Which information can be in your Subsections (accessible from each Main section)? And what about Explanations (small pop up windows or detailed sub pages for specifications)? Always aim for easy navigation – whether it’s ‘self select’ or ‘guided’. Always insist on well-written content. What will they want to do? Research is a key element in the design of a successful Website. How can you satisfy them? How can you make them use you? How do they prefer to get in touch? How you can prove it. How you can demonstrate the benefits of your product or service. Start and finish with key messages. 87% are enraged when sites are slow to download. 83% find help buttons unhelpful. Well-chosen words are crucial to the effective delivery of your message. That’s why we’re always glad when our clients invest in a specialist copywriter. Remember - you may only get one chance to impress your visitors. So get your text written professionally. Information on your site must be distributed carefully and logically. Plan your page layout for maximum impact. Ensure that you’re easily understood. The type should be neither too big nor too small. This type is 12 point. If you need a lot of text, create a further sub-page. Remember - it’s a Website, not a brochure! Simple illustration beats wordy description. Keep file sizes small for fast download. Use professional photos and line drawings. Giving your site an unfair advantage. Our Monitoring and Maintenance packages keep it in top condition. Our Search Engine Optimisation ensures that keywords and phrases are regularly updated. Promote your site – everywhere you can! Promoting your site increases visitors – which increases business.